WASHINGTON, DC — The ongoing deteriorating security conditions on the ground in Afghanistan do not warrant the proposed withdrawal of American troops, the top commander charged with overseeing U.S. military activity in South Asia declared on Thursday. His comments came soon after news reports surfaced of a Pentagon proposal to pull out all U.S. troops from Afghanistan within three to five years, which was offered to the Taliban as part of a potential peace deal to end the more than 17-year-old war. In unveiling his Afghanistan strategy in August 2017, U.S. President Donald Trump emphasized that he was planning to abandon his predecessor’s time-based approach in favor of conditions on the ground. “Conditions on the ground, not arbitrary timetables, will guide our strategy from now on,” he declared. Gen. Joseph Votel, the head of U.S. Central Command (CENTCOM), stressed that the Pentagon had not yet received any orders to withdraw. “My best military advice is that we should make decisions based on the political progress,” he added, referring to the ongoing peace negotiations when asked if current ground conditions merit a U.S. military withdrawal from Afghanistan. “The political conditions where we are in the reconciliation right now don’t merit [a U.S. military withdrawal],” he concluded after a lawmaker pressed him to respond. Taliban narco-terrorists — who generate most of their funding from trafficking deadly opium that is partly fueling the unprecedented number of drug overdose deaths in the United States —control or contest more than 45 percent of Afghanistan’s districts, a U.S. watchdog agency reported at the end of January. Opium is the main ingredient in heroin. The Taliban has intensified attacks amid peace negotiations and managed to continue seizing territory. What I think winning in Afghanistan means, it means two things…It means a negotiated settlement between the government of Afghanistan and the Taliban, and it also means safeguarding U.S. national interests. Particularly ensuring that this country, this region can’t be used to attack our homeland. So that would have to be satisfied as of any overall [peace] agreement. Trump administration officials have conceded that a military victory in Afghanistan is impossible. In recent months, the Trump administration has intensified peace-seeking negotiations with the Afghan Taliban, which continues to refuse to allow the Afghan government to participate in the talks despite U.S. insistence. During the ongoing round of negotiations — which began last week — negotiators are mainly focusing on fleshing out the framework for a deal agreed to “in principle” last month. Under that framework, the U.S. would withdraw troops from Afghanistan in exchange for Taliban assurances that Afghanistan will not harbor international terrorists, including its ally al-Qaeda and rival the Islamic State (ISIS/ISIL). Trump administration officials and the president himself have suggested that a residual American force would remain in Afghanistan following a significant withdrawal to ensure the jihadi group keeps its promises, a proposal that the Taliban rejects. The Taliban has demanded that U.S. troops leave Afghanistan in one year. 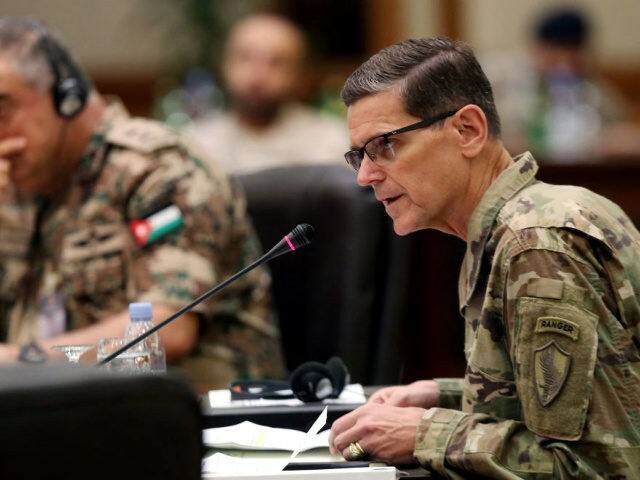 Votel suggested that Russia may benefit from a potential U.S. withdrawal from Afghanistan and the already scheduled pullout from Syria where Moscow is backing dictator Bashar al-Assad. “Our withdrawal from there gave them the opportunity to fill the void. Obviously, things that would come after that would increase their influence. … It would certainly give them the ability to be in a better position,” he said. Russian and Iranian support has allowed dictator Assad to gain control of more territory in Syria than any other warring party.